What major applications are installed on the desktop computer in Room 1A1, the Ewart Angus Centre? Can I run my presentation from the desktop computer on the podium? Should I bring my AV materials on one or two USB sticks if I am going to use the podium pc? Can I run my presentation from my own laptop computer? Can HAALSA provide any technical assistance before and during my presentation? Is there a microphone for me to use? Can HAALSA provide a hand-held laser pointer? Q: What major applications are installed on the desktop computer in Room 1A1, the Ewart Angus Centre? Q: Can I run my presentation from the desktop computer on the podium? One of the applications installed on the podium pc — see the previous question — can be used to run/show your audio-visual materials. For example, if you have a PowerPoint 2014 file, you can show it with PowerPoint 2016, and if you want to show a video that's on YouTube, you can do so with one of the web browsers. If you want to run/show a file that is not available for viewing or downloading from a website accessible from the podium pc, you will need to bring your file on a USB stick, which you will plug in to one of the usb ports on the side of the desktop monitor. You can then drag a copy of your file on to the pc's desktop, from where it can be opened. Another option is to upload a copy of your presentation file to your DropBox, Google Drive or equivalent account, to serve as a backup in the unlikely event that the copy on your usb stick becomes corrupted or otherwise unavailable. The online file(s) can easily be downloaded to and run from the podium pc. Q: Should I bring my presentation file on one or two USB sticks if I am going to use the podium pc? Q: Can I run my presentation from my own laptop computer? You need to be able to connect your laptop to a HDMI (High Definition Multimedia Interface) input cable on the podium. That cable sends your outgoing audio-visual content to the digital projector at the rear of the room. The projector displays your content on a large screen on the front wall of the room. 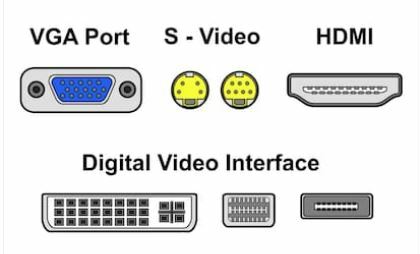 The cartoon at left shows AV ports commonly found on various electronic devices, including laptops. Some laptops have a "mini-HDMI" port (a half-inch or less in width) rather than a "full-size" (wider) HDMI port. If your laptop doesn't have a full-sized HDMI port you'll need to bring your own port-to-port adaptor cable. 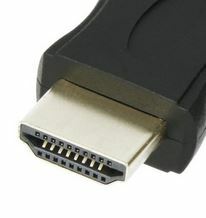 An adaptor cable is used to make a connect between a laptop's audio-visual output port (a 'female' terminal for VGA, DVI or HDMI signals) and the 'male' terminal — see the image at left — at the end of the podium's HDMI cable. Owners of Apple laptops refer to this type of cable as a "dongle". HAALSA can provide a dongle suitable for only some Apple laptops; one end plugs into the laptop's 'female' mini DisplayPort terminal; the other end accepts the 'male' end of a full-size HDMI terminal. If your laptop has a different audio-visual output port, you will have to provide your own adaptor/dongle. If you have an HDMI cable with full-size male terminals at both ends, bring it plus your dongle. If you don't, HAALSA can provide that cable. Note also that if you are using your laptop and wish to connect to the internet in order to download or display something, you can establish a wi-fi connection to the internet for your laptop if you have the necessary login credentials for the university's "Mac-Wi-Fi"" or "eduroam" networks. Alternatively, you could download or display the desired resource(s) via the podium pc, which has a permanent internet connection. Past experience suggests that it is often quicker and easier for the presenter to use the podium pc for downloading files, which can then be moved via usb stick to the presenter's laptop if it is not practical to display the resource via the podium pc. Q: Can HAALSA provide any technical assistance before and during my presentation? A: Yes. A HAALSA member will be delegated to assist you in getting set up, either on the podium pc or your laptop. Q: Is there a microphone for me to use? A: Yes. Currently the room is equipped with a podium mic and a lapel mic. However, we have learned that the label mic alone does not provide a satisfactory audio experience for our audiences. Consequently, we ask our speakers both to use the podium mic and to wear a lapel mic, just in case the speaker moves briefly too far from the podium mic during their presentation. Q: Can HAALSA provide a hand-held laser pointer? A: Yes. Our pointer displays a red dot.